Lachlan and Peter are very good buddies. They get along great, for the most part. Of course they have their moments and this morning was one of them for Lachlan. He was getting so mad, so quick. This seems to be a bit of a Monday routine as weekends are full of adventure and light on sleep. But I know, that Lachlan could not survive the day with out the friendship and play from his brother. So I took that away, for just a short time. Lachlan, you are being too mean, you need to have some time in your room alone. Some down time. He went and was willing. Peter and I played out in the living room. 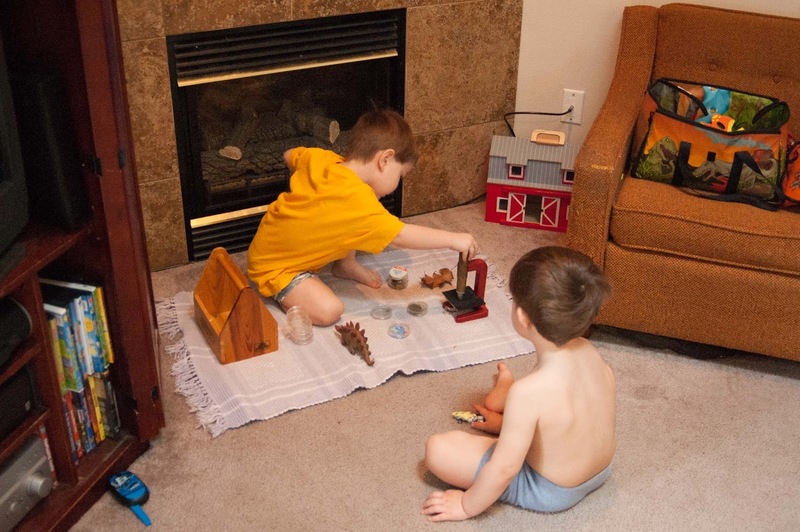 It wasn't 5 minutes later that Lachlan came up with a super cool idea for playing and wanted to show his brother. Peter, he called. I responded. Sorry bud, you can't play with Peter for a little while longer. He called again and again I responded the same. This worked out, only because Peter was helping me with chores and okay with sticking to that. A little while later, Lachlan came out of his room. I asked him if he was ready to play nicely with his brother. He said he was and we carried on. They played nicely for an hour or more. Playing make believe about dinosaurs and volcanoes. It seems Lachlan doesn't like being with out his brother after all. I think he takes his playmate for granted sometimes. Again, Lachlan started to get quick to respond in anger. So again I encouraged him head to his room. 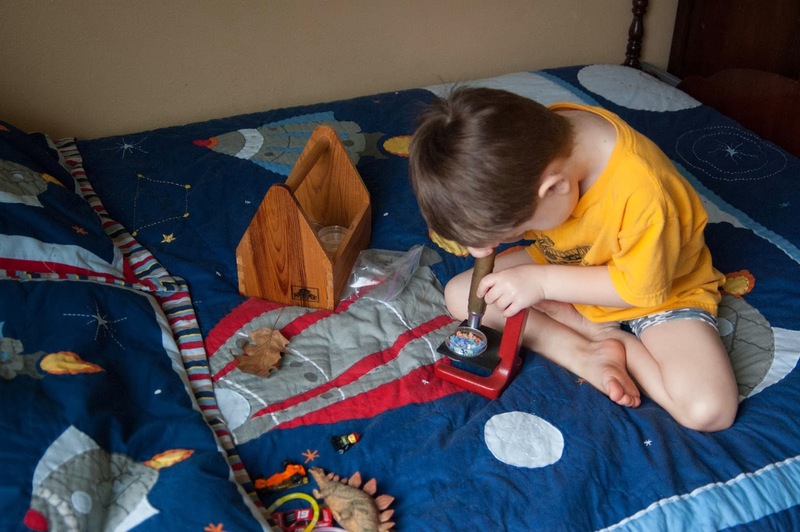 I came in to check on him a little while later and he was set up with his science kit on the big bed. Examining the specimens. He couldn't quite stand, not also including Peter in his science project and brought the whole thing out to the living room to share. I got out a rug for him to set up on and he chose to set up in front of the fire place. Then started showing Peter all about his science lab. He made Peter his assistant to go fetch things that he could look at under the microscope. I am not saying this tactic will work tomorrow, because it most likely won't. But it did for today and maybe I can get another couple uses out of it. Let's hope so.